The most obvious difference between cycling shoes and other athletic footwear is that they attach to the pedals – and if you needed an excuse, it is the noticeable pedalling efficiency this gives that can be the best reason for getting into a pair of good cycling shoes. Having this foot-to-pedal connection improves the power of each pedal stroke by allowing the rider to apply force through the entire 360 degree rotation. A secondary but also important aspect is to keep your foot in place (and anyone who has had a foot slip off a pedal while pushing hard will know how brilliant an innovation this is). A proper-fitting cycling shoe should be noticeably but comfortably tighter fitting compared with a general sports shoe. While the latter may need a bit of room to accommodate some foot movement from the impact of running or walking, any such “room to move” in a cycling shoe will just be counterproductive. In fact the looser the fit, the more inefficient is the transference of drive from power source (your legs) to machine (your bike). So getting the right fit is important, and better cycling shoes will come with plenty of adjustment capability to fit most foot shapes. Of course every foot is different, and the advice from many experts is to look around and try various shoes before you buy. Some have more room at the front, wider or narrower bodies and other variables – all aimed to achieve better fit. Shimano has even developed a “custom-fit” system for example, which boasts that the shoes are made to fit your foot, rather than the other way around – which is achieved by a process similar to shrink-wrapping the shoe shape to your own foot. Thorpe says there is at least one other shoe brand that is looking to launch very similar custom fitting technology in 2012. He also stocks Bont brand shoes, which are heat mouldable, but also can be custom made to a cast taken from a buyer’s actual foot. Doing this can take up to six weeks for the shoes to be manufactured. Laser scans can also be used, or a set of plaster bandages. Similar “minimal-movement” science leads to the rule-of-thumb that the stiffer the sole the more stable the power transfer. So in one regard, the material used in the sole of a cycling shoe can be a good indication of expected performance. Lower-end shoes will use injection-moulded plastic for sole material. This is more flexible and also heavier, but makes for soles that are economical to produce. Mid-range shoe soles may also be based on plastic but combine this with fibreglass or carbon fibre – adding either of these two materials makes the sole stiffer and lighter, but also adds to expense. All higher-end and competition level shoes use carbon fibre soles, which is lightweight and very stiff, providing a stable platform. One innovation that has been taken up with great enthusiasm by many European professional cyclists is the Solestar cycling insole. Made from a specialised carbon material, the insole is light and strong, but unlike conventional forms of carbon has the capability to absorb torsion forces created during the push and pull phases of pedalling, twisting with the movement and then returning to shape. Developed by Cologne-based cycling training expert Oliver Elsenbach, such orthopaedic insoles have been found by professional cyclists to improve the transfer of power from shoe to pedal through their ability to more evenly distribute forces to the part of the foot that is positioned right where the cleat attaches. The idea of such insoles may be especially helpful if, for example, a cyclist’s skills or needs outgrow a pair of shoes bought when the rider was less experienced. With off-road cycling, because the rider is more likely to make contact with the ground sometimes, shoes may require a little more flexibility in the sole – or at least in the toe area. But even some roadies can find that too stiff a sole can lead to foot pain or numbness after long rides, so stiffer isn’t always better, and some manufacturers provide padding or inserts that can help. At times problems can also manifest once a sole becomes looser or less conditioned (and here is where the Solestar-style of insole may help). For many riders it all boils down to finding the right balance between performance and comfort, which will be your individual decision to make. Wade Thorpe says that nine times out of 10, riders coming in for shoes will see comfort as the biggest issue to satisfy. “Although if you talk to any reasonably good cyclist, and certainly the professionals who will ride thousands of kilometres a year, they will be looking more at performance,” he says, conceding however that the best shoes will also maintain comfort, even after hours of riding. In very general terms, there are two basic types of cycling shoe – the ones you can walk around in easily, and the more awkward variety (made so by reason of exposed cleats and very stiff soles). Again, your choice is going to be dictated by the sort of cycling you’re most likely to do. Shoes with recessed cleats will let you more easily jump off and walk (to push your MTB uphill for example, or to be kinder to your favourite cafe’s floorboards), but if your focus is more on speedy road riding or racing, you can decide to forego options such as recessed cleats, more flexible soles, or even being waterproof (some road shoe soles even have perforations to drain water away). The clipless system of connecting shoe to pedal was developed in the 1980s (taking its cue from snow ski bindings), although Shimano came to dominate the technology soon after. You may even hear this simply referred to as SPD (“Shimano pedalling dynamics”, if you were wondering, although there are many other clipless pedal brands). There are two types of SPD cleats however – one that fits a cleat to a shoe with two slots (used a lot with MTB and recreational shoes), and the SPD-SL (primarily used with road bikes) which has three holes for fixing the cleat. A great many shoes will feature both two slots and three holes (see the sole of the Shimano RO77 for example) it’s worth being aware that there are differences. The three hole system should also fit other pedal brands such as Look, Speedplay, Time and so on, but there are some variables about which your local bike shop should be able to advise. Fiona Cook at Clarence St Cyclery in Sydney says the style of cycling shoe most leaving the shelves are the SPD varieties. The Cyclery stocks many brands and choices – because, as you may have gathered by now, buying the right shoe is very much an individual decision given the huge variances in foot shape and size, as well as style of bike and intended riding. The choices that have to be made when searching for the right pair of cycling shoes can seem bewildering – the fastenings, the cleats, recessed or not, the sole material, insoles, and even the colour. But there is one thing you want to be definite about – the fit! Oliver Elsenbach has had more than 10 years experience advising professional cyclists about body measurements, training supervision and fitting insoles and cycling shoes – he is also the inventor of the Solestar carbon insole (see main article). With more than 5000 fittings done for professional cyclists, he knows a lot about finding the right shoe for any foot. Here are Elsenbach’s top five tips on what to look for when choosing a cycling shoe, and how to find the best fitting shoe. The front part of the foot is the most sensitive when considering the transfer of power from the feet to the pedals. The widest part of the foot should not be exposed to any unnecessary pressure. Carefully check that you have the most optimal fit in this area of the cycling shoe. The shoe should be secure, yet not exert too much pressure at these points. It’s important to note that the width of the foot expands slightly during longer training sessions. If you buy the wrong shoe, you risk experiencing pain later. An optimal length is the most important factor when buying new cycling shoes, and this is totally different to buying normal walking shoes. You don’t need the extra room in the shoes during cycling that you would otherwise need in the normal rolling motion of the feet when walking or running. Therefore, to get the most optimal size, your big toe only needs a millimetre or two of extra space. If the shoes are too big, then the cleats cannot be optimally mounted, resulting in a further loss of power transfer to the pedals. Don’t compensate any problems with the width by buying cycling shoes that are the wrong length. Both measurements should fit perfectly. An optimally-fitted shoe provides a secure anchor for your heel, which shouldn’t normally slip. Nor should there be any extra pressure while walking. For a perfect fit, the heel shouldn’t be moving at all. The middle of the foot should also be securely supported. The upper part of the shoe, which covers the foot, should also completely secure the foot. A perfect fit, provided by the covering material and the fastening system, is vital during the normal rotational phase, where the pedal is pulled back diagonally. Be aware of your pedal’s fastening system. It’s there to make sure that the shoe fits securely and that it provides the necessary support, even under strenuous conditions experienced during the rotational cycling motion. Buckles and Velcro should not exert any additional pressure under any circumstances. When securing your shoes, make sure that the top material of the shoe is not folded at all, otherwise this could apply extra pressure on the feet. This could also be an indication that the shoes do not fit in an optimal way. The fastening system should also be easy to use, so much so that you can secure or adjust the shoes even when on the bike. After all has been said and done, your cycling shoes should feel completely comfortable. Needless to say, they should also appeal to you. If, while trying on a pair that you like, you notice that the fit isn’t exactly perfect, or you are not completely sure, ask if there are any alternative fits (broader or narrower) that would suit your foot shape better. If the store does not have the correct fit, see if one can be ordered or try a different dealer. These shoes are by no means recommendations, but are a wide example of the choices out there. Prices are “estimated retail price” (ERP). Off-road racing performance shoe. $169. Tough synthetic leather for good durability, micro-adjust buckle and dual off-set straps. A flexible insole conforms to a wide variety of foot shapes. The sole has a soft arch pad, glass fibre reinforced polyamide sole with optional spike mounting. Women’s road riding shoe. $269. Gripper fabric on inside of heel to prevent slippage or friction. Removable innersole and replaceable arch support. Full length tongue said to help prevent irritation. Tough stretch resistant synthetic leather and mesh upper for breathability, triple asymmetrical straps to help prevent pressure points. This shoe has a more accommodating toe box. Glass fibre reinforced polyamide midsole plate and rubber tread for traction and walking comfort. Mountain bike specific shoe. $299. Natural leather, good fit for narrow foot. High degree of man made components. Replaceable sole pieces (handy, as when they wear down you don’t have to replace the whole shoe). Designed for recreational, on and off-road cycling. $129. Multi-layer stretch resistant synthetic leather and mesh, lacing closure plus hook and loop for snug fit. Has a roomier toe box. Rigid glass fibre reinforced polyamide midsole and rubber sole for walking. Women’s mountain bike shoe. $249. Natural leather, good fit for narrower foot. 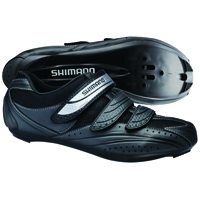 A race style shoe, which Clarence St Cyclery says is uncommon for a female mountain bike shoe. Features heel cap on the outside of shoe body for more comfort. Classic dual strap design for secure, comfortable fit, natural leather upper, moisture control mesh layers, contoured foot bed. Glass fibre reinforced shank plate, wide rubber sole for comfortable riding and walking. Road shoes, hand made in Italy. $499. Heat mouldable innersole. Made from kangaroo leather (tougher than cow leather). Shoe straps made from same material as yacht sails – very strong material. Women’s specific fit. Full-featured SPD-SL, ideal for race and recreation road rides. $169. Tough stretch resistant synthetic leather and mesh, micro-adjust buckle and dual off-set straps, snug fit, durable and breathable. Glass fibre composite sole. Women’s MTB design with a commuter focus. $149. Great value, light weight, tough medial and lateral side mud guards. Great for walking around in once you get off the bike. Multi-layer stretch resistant synthetic leather and mesh, lacing closure and hook and loop for snug fit. Glass fibre reinforced polyamide midsole and rubber sole. Elite racing shoe, full-featured SPD-SL light weight performance shoe. $249. Oversize micro-adjust buckle and dual off-set straps, stretch resistant synthetic leathers and moisture control mesh. Anti-slip heel lining knitted with metal fibre to stop heel lift, dual density insoles. Carbon fibre composite sole. Available in half sizes and wide type. Single seam bonded upper. Great fit for wider foot, “eSoles” footbed removable innersole, replaceable arch support depending on individual requirements. Tough synthetic leather and mesh, triple asymmetrical straps prevent pressure points, snug, durable and breathable. Lightweight glass fibre reinforced-polyamide sole. SPD and SPD-SL cleat compatible. Women’s off-road sport shoe. $139. Tough stretch resistant synthetic leather and mesh, micro-adjust buckle and dual off-set straps. Glass fibre reinforced polyamide midsole plate, durable rubber tread. Natural leather, but high degree of man-made components to minimise stretch. Good fit for narrow foot. Great fit for wider foot. Boasts “eSoles” footbed on removable innersole, replaceable arch support depending on the degree of support you need.